"BROKEN" is a ride on an emotional roller coaster, a display of being on the brink of many emotions-the very edge of loosing control. "What would you do? ","How would you react? ","Why are you feeling this way?" These are the questions that I'm bringing to the stage in this piece. I seek to explore the very beauty and purpose of emotional pain. There is a certain beauty in that pure emotion that paralyses you so that you can only lay on the ground releasing primal screams of frustration. As part of the residency process, I will be creating video/projections and presenting visual art to capture the demons, spirits, and other inhibitions associated with the struggles of the mind and emotions in turmoil. Come with us to witness our journey as we dream of angels ,but live with demons incorporating a powerful and thought provoking soundscape conceived by myself and Tom Luketich featuring music by Bjork, original compositions and spoken word. The vision of my choreography seeks to confront and conquer issues that are relevant and present in our society through my choreographic style that incorporates contemporary modern, butoh, and African movements and gestures based on pure raw emotion and musicality. "Broken" is a small group work initially presented as a duet featuring the DANA Movement Ensemble.The running length will be 45 minutes to an hour broken into sections without an intermission. "Take my Hand.....I am Here" is an intimate look into love and loss . Designed as a tribute to his parents, choreographer Nick Daniels along with composer Tom Luketich collaborated to create this melancholic retrospective of Nicks time of grief . The DANA movement ensemble's 6 members presents this emotion driven performance merging sound,video imagery, body and spirit with inspiration from butoh, contemporary dance and Luketich's recorded digital soundscape featuring composers Aarvo Part , Steve Reich and traditional hymns. 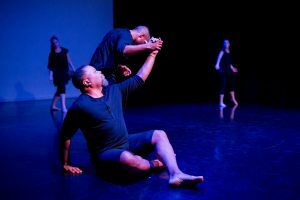 "Folkdances of a nucleic village"is a collaborative effort of the DANA Movement Ensemble creative team led by Founder/artistic director Nick M.Daniels. 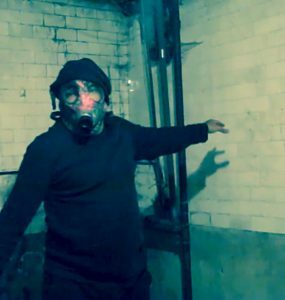 This multi-media/multi-disciplinary dance theater performance art piece takes us on a journey into a post nucleic city and confronts the socio-political-economic climate of that time. 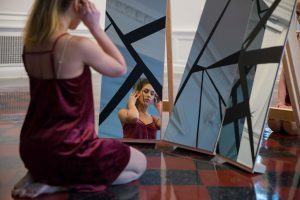 By combining site specific imagery, live streaming video, dance,and theater this emotionally charged work truly confronts relevant and current events and issues and lends itself for discussion of these issues. "Sissy" is an evening length multi-disciplinary work that delves into my personal story, opinions and perceptions of gender identification and my exploration of masculinity versus femininity. I have many memories of over-hearing conversations about the way i behaved as a child. I was labeled a sissy early on though I never fought nor embraced it. But, in this piece those feelings will be explored. My choreography is based on butoh, African, modern, and contemporary styles and challenges my dancers and audiences to connect on an emotional level that pulls from their personal experiences and from within their souls. Tom Luketich will compose original music and create the soundscape which will encompass many styles including opera, modern, spoken word and distorted sound effects; and I will design/coordinate costumes, props, and set design that will to support my ideas.